According to legend, aliens visited an ancient civilization and left behind crystals that allowed the civilization to travel through time. These crystals became known as the Eyes of Guidance. You know the locations of the eyes and want to claim them. Move through six levels of catacombs, tombs, tunnels, and rivers while blasting skeletons, spiders, zombies, and rats. 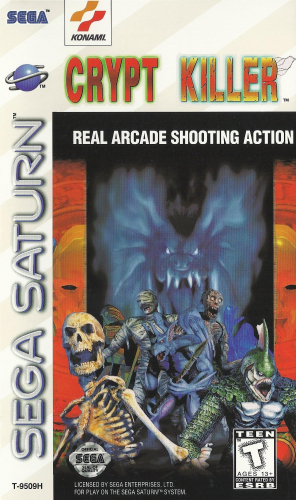 If using the standard controller makes life too difficult, plug in any Sega Saturn-compatible light-gun and let the good times roll. Do you have the skills and reflexes to survive CRYPT KILLERS?